One of my favorite beauty brands, Caudalie, uses grapeseed oil as a key ingredient in many of its products, and after using a bottle of pure grapeseed oil for a couple of weeks, I'm convinced I know why. It's a natural beauty elixir that seems to have magical powers; it's an oil yet it works extremely well for oily skin, and has both healing and anti-aging properties (meaning it fights wrinkles and blemishes at the same time). Plus, it's surprisingly lightweight and absorbs quickly, so skin and hair don't feel oily or heavy after using it. 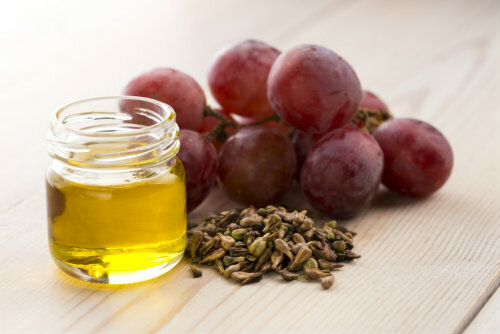 Here, ten ways to incorporate grapeseed oil into your every day beauty regimen. 1. Give your facial moisturizer a boost by mixing in a few drops. 2. Mix with essential oils and use as a massage oil. 3. Pat under eyes to help alleviate dark under eye circles. 4. Dab on blemishes to help them heal faster; it's full of antioxidants and anti-inflammatories, making it an ideal acne fighter. 5. Combine with your body butter or lotion to enhance its moisturizing properties. 6. Use as a hot oil treatment for hair to strengthen your strands and help them grow longer. 7. Heal acne scars over time. 8. Use as a nighttime serum and wake up to firm, youthful, glowing skin. 9. Dab on painful cracked cuticles to help them heal faster. 10. Use a few drops as a nourishing shine serum for hair.